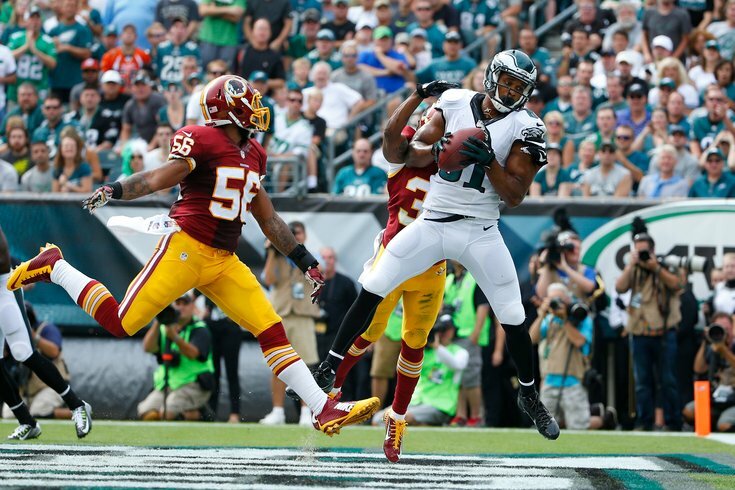 After missing the Bengals game a week ago, Jordan Matthews will return to the lineup to face the Redskins. The Washington Redskins head into Philadelphia to face the Eagles with 12 players listed on their Friday injury report, while the Eagles are very healthy, as they've been all season. • WR Dorial Green-Beckham: Over the last three games, DGB has been the Eagles' most productive receiver, although that's a pretty low bar. • RG Brandon Brooks: The Eagles announced an hour and a half before the game that for the second time this season, Brooks has an illness and will miss today's game. • OT Halapoulivaati Vaitai: With Vaitai out, Allen Barbre will once again start at RT, with Stefen Wisniewski filling in at LG. • DT Taylor Hart: Hart was signed over a month ago in anticipation of Logan being out, but he has not yet been active for any game yet. • OT Dillon Gordon: Gordon is a versatile player the Eagles want to develop over time, but he'll be inactive for the foreseeable future. • RB Kenjon Barner: With three healthy running backs now ahead of him and injuries at other positions, Barner will sit this one out. • LB Kamu Grugier-Hill: Special teams player only for the Eagles this season. • RT Lane Johnson (suspended 10 games): Seven games down on Johnson's suspension, three to go. • CB Ron Brooks (IR): As a player, Brooks isn't exactly a world-beater, as he doesn't have a single interception, sack, or forced fumble over his five-year NFL career, however, his loss will further deplete an already thin group at cornerback. In Brooks' absence, Malcolm Jenkins has dropped down into the slot in nickel packages, with Jaylen Watkins coming off the bench to play safety. • OG Shawn Lauvao: Lauvao is the Redskins' starting LG. Arie Kouandjio will likely get the start. • S Will Blackmon: The Redskins' starting safeties to begin the season were DeAngelo Hall and David Bruton, who are now both on IR. Throw Blackmon on the pile now too. Donte Whitner and Duke Ihenacho will likely start at safety for the Redskins this week. • C Spencer Long: Long filled in for Kory Lichtensteiger when he went on IR earlier in the season. The new starter at center will now be John Sullivan. • RB Matt Jones: Jones was the Redskins' starting running back to begin the season, bt has tumbled down the depth chart. • DE Anthony Lanier: Back of the roster guy. • WR Rashad Ross: Back of the roster guy. • QB Nate Sudfeld: Third quarterback. • OLB Junior Galette: Productive pass rusher who had 12 sacks in 2013, 10 sacks in 2014, and hasn't played since. • S DeAngelo Hall: Hall's season is over after tearing an ACL. He was a starting safety. • S David Bruton: Bruton was the Redskins' other starting safety. • WR Josh Doctson: Doctson was the Redskins' 2016 first-round pick. He has been out since Week 2, but obviously, the Redskins have their share of good receivers in DeSean Jackson, Pierre Garcon and Jamison Crowder. On the season, Doctson had two catches for 66 yards. • C Kory Lichtensteiger: Third-year pro Spencer Long took over at center for the Skins, who is also out this week, as noted above. • NT Kedric Golston: Golston was part of the Redskins' defensive line rotation.